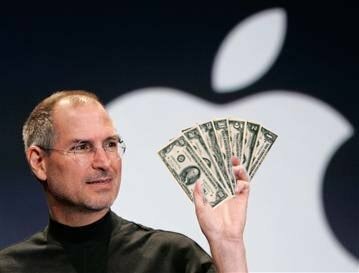 Congrats to the Cult of Mac for helping to create the “World’s most valuable company.” $337.17 BILLION dollars. I don’t care to divide the cost of an iPhone into that amount, mostly because I know it’s not that simple. Awe-inspiring numbers aside, it is quite remarkable what Apple has achieved. Chiefly, they have created an army of faithful followers who just gotta’ have that new product, regardless of personal necessity. And look at what it’s done! It’s created a company that possesses a market cap that’s greater than that of Exxon Mobil. Our fuel is now plastic and handsomely designed! David asked me on the train about how many New Yorkers own iPhones. I guessed around 50%. I guessed wrong: There are probably more. Previous Post Is that you, Sarah? Weird. Apple is #109 in terms of overall revenue (Exxon is #2, Wal-Mart #1). I guess what accounts for that discrepancy is the market’s assumption that Apple will continue to introduce and refine products that change everything, whereas Exxon will just keep pumping more oil and Wal-Mart will just open more stores. (I’m sure there’s a term for this). Neither will make any revolutionary contribution, and obviously Exxon’s days are numbered. Well, technically that plastic is made from that fuel….